A festive, hot and spicy roasted whole turkey served with a refreshing mango salsa. Mix chili powder, coriander, brown sugar, ginger, garlic powder, onion powder, kosher salt, cinnamon, allspice, black pepper and cloves in small bowl. Cover and set aside. 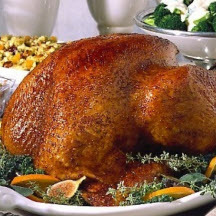 Remove neck and giblets from body and neck cavities of turkey; refrigerate and reserve for gravy. Drain juices from turkey; pat turkey dry with paper towels. Turn wings back to hold down neck skin. Place turkey, breast-side up, on flat rack in shallow roasting pan. Rub turkey evenly with oil and sprinkle with seasoning mixture. Roast turkey in a preheated 325°F (160°C) oven for about 2 hours. Remove from oven and cover breast and tops of drumsticks with aluminum foil to prevent overcooking. Continue to roast for about 1 1/2 hours or until food thermometer reaches 180°F (85°C) when inserted deep in thigh. For Mango Salsa: Combine mangoes, onions, cilantro, jalapeño pepper, lime juice, oil, salt and pepper in medium bowl. Cover and chill. Serve spooned over the turkey slices.